Japan is a country beyond dreams and imagination. Enjoy a journey from the buzzing multi-million city of Tokyo to frozen Japanese macaques, cranes swept into mist, whooper swans bathing in hot springs and the giant Stellar eagle at sunrise. It’s a great experience to visit Japan in the winter, both for its mythical culture to world-class nature photography. 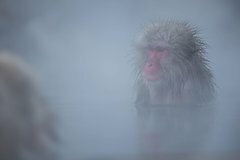 Snow-covered landscape, diminutive cranes in morning mist, then witness their breathtaking dance, Japanese macaques (snow monkey) or whooper swans bathing in hot springs. To experience the “land of the rising sun” and to photograph the giant Stellar eagle or sea eagle that poses on drift-ice or dives in full attack to catch fish to survive the day is a spectacular event on its own.